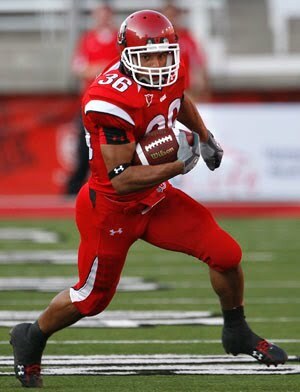 Few have been as good the last few years than the Utah Utes. Jordan Wynn returns this season after replacing Brian Johnson last season. The ground game is strong with All Conference Selection Eddie Wide. Wynn needs some options to pass to though. Luckily he has time to make decisions with his offensive line as talented as it is. Guard Caleb Schlauderaff is an All Conference Selection, and so is center Zane Taylor, both are seniors. On defense, the Utes lost alot. Including, linebacker Stevenson Slyvester and end Koa Misi. The Utes have five returning starters on defense including 3 on the line, including Derrick Shelby, Dave Kruger and Sealver Siliga. The secondary will get help from the D-Line. The cornerbacks don't need it though as they return Brandon Burton and Lamar Chapman. On special teams the Utes retrun kicker Joe Phillips and punter Sean Sellwood. Key Games: Nov. 13 vs. Notre Dame Quick Pick: The Fighting Irish lost Jimmy Clausen and Golden Tate but they will still be a big challenge. Utah wins. TBA vs. TCU Quick Pick: TCU will give any team a challenge. Jordan Wynn goes up against Andy Dalton. TCU escapes.